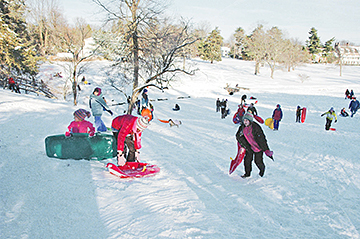 AFTER THE STORM: Springdale Golf Course resembled a Currier & Ives scene Sunday as people got out their sleds and enjoyed the up side of Saturdays big snow. At last weeks Board of Education meeting, Superintendent Judy Wilson announced that Princeton High School (PHS) was ranked 94th in the nation in a recent U.S. News & World Report article. PHS was the highest ranked open-admissions public high school in New Jersey and the only open-admissions public high school in the state to make it into the top 100, she reported, congratulating Principal Gary Snyder, the PHS faculty and professional staff, the PHS administrative staff, the PHS support staff, and PHS students and parents on achieving this recognition. More than 3,500 Princeton residents have been inoculated so far for the H1N1 virus, reported Township Committee Member Sue Nemeth on Monday evening. She noted that there will be additional public clinics in the coming weeks, and that appointments are required. Residents are encouraged to check the Borough and Township websites for details. The New Jersey Department of Environmental Protection (DEP) is developing wastewater management rules, as part of the new Wastewater Management Plan, that could have implications for future development in municipalities across the state. Members of the Stony Brook Millstone Watershed Association presented their views to the Princeton Environmental Commission (PEC) during a meeting last week. With an expanded array of programming, the upcoming Environmental Film Festival at the Princeton Public Library offers a powerhouse assembly of films, speakers, discussions, and diverse subject matter, for what promises to be an engaging two weeks in the new year. All events are free and open to the public. With construction progressing at a steady pace along Paul Robeson Place and Chambers Street, the Residences at Palmer Square, also known as Hulfish North, will begin occupancy in stages, with the first residents moving in by spring of 2010. As the Princeton High girls swimming team competed at Lawrence High last Thursday, Serena Deardorff knew that she was facing one of the first stern tests of her high school career.